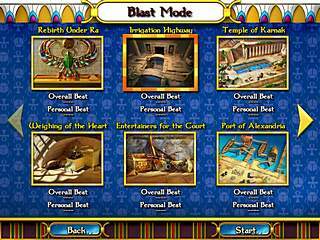 As you can see from the title, it is the 5th game in the Luxor series. 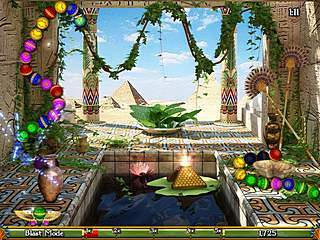 Luxor 5th Passage from MumboJumbo is a sequel with many prequels, which means there is danger of runing out of ungrades and innovative ideas. But not here and not now. This sequel has enough to stand out, but still remain as addictive and entertaining. 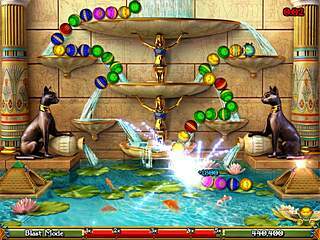 This Egypt-themed game is actually a great puzzler full of many new power-ups. There isn't too much of a story offered here. Only a little bit of text given to you before you start the labor of shooting the marbles. And that is neither surprise nor a disappointment because usually this game genre doesn't aim to boast with long deep stories. The game provides you with a world map and you start the journey. This journey will take 100 stages, which are devided into sections. Completing each section gives you and additional bonus level. That's not all that is waiting for you here. There is aspecial People's Choice mode where you can replay the stages from the previous Luxor games. Apart from that there is also another surprise for the game fans. It is like a delicious dessert being so addictive. There is a blast mode where you are given two minutes to rack up as many points as possible. The general gameplay hasn't changed much. If you played the previous games, you'll know what to do here. You will get a line of colored balls moving from one end to another. Your task is to shoot them all from the bottom of the screen before they reach the end. The shooting happens when you aim at group of three or more balls of the same color. So having left this part of the game pretty much the same, the developers have made a few changes with the power-ups. The electric ball and the fireball are back in this game. Plus there is a black hole that eats up the near by balls. All of the new power-ups are very useful as you make you way through the game. The bonus stages that you get every once in a while serve great as a change of actions keeping the general gameplay fresh. The game looks and sounds very pleasant according to the genre. The game can be adjusted to the difficulty level that you need offering four of them together with different trophies which you can earn. I am going to Drayton Manor in August and I have never been on a proper thlinlirg roller coaster, I need to know which roller coaster to go on first so that I won't be too frightened to go on some others. Please can you tell me the amount of G Force that each roller coaster there has. Thanks in advance! I am going to Drayton Manor in August and I have never been on a proper thniillrg roller coaster, I need to know which roller coaster to go on first so that I won't be too frightened to go on some others. Please can you tell me the amount of G Force that each roller coaster there has. Thanks in advance! This is Luxor 5th Passage review. Download this game here.